For thousands of years the visible planets of our solar system have captivated experts and the general public alike. With a history more ancient than that of any other of the physical sciences and with recent popularity and prestigiousness, it is difficult to believe that this field was avoided by astronomers and scientists during the first half of the twentieth century. However, during the field’s darkest hours at mid-century, planetary astronomy experienced a dramatic and miraculous rejuvenation, entering an era of solid achievement, mushrooming growth, and spectacular triumphs. Experts credit this unexpected turn of events to the rise of the U.S. space program, in particular the programs beginning in 1958 administered by the National Aeronautics and Space Administration (NASA). NASA funds provided both ground-based facilities and spacecraft that made it possible for those scientists to make a series of stunning discoveries. But, before examining the present, the past must be explored to fully illustrate and understand how times, ways of thinking, and planetary astronomy itself have changed over the millennia. 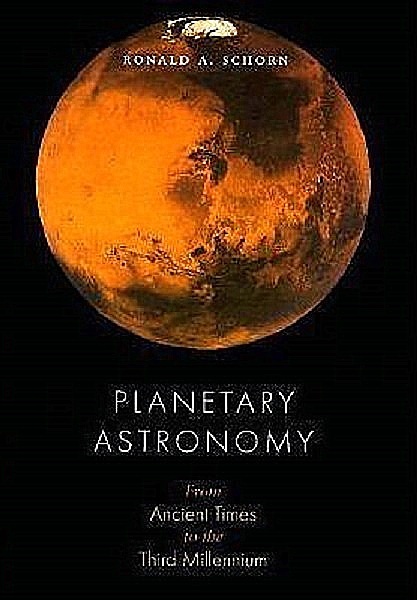 In “Planetary Astronomy: “”From”” Ancient Times to the Second Millennium, ” Ronald A. Schorn presents a firsthand account of the triumphs, tragedies, and fiascos in the field. He covers why the science “fell from grace,” presenting both the nonplanetary astronomers’ and planetary astronomers’ viewpoints. Drawing on hundreds of interviews, direct observation, and extensive documentation to render events with a sense of immediacy and reality, he gives the reader an idea of what situations were like when no one knew the answers. Schorn’s look into the world’s oldest science from ancient times to the present offers more than the usual time line of events. This rare “inside” examination will interest readers of space exploration, astronomy, and the history of science.